Syrian army has entered the ancient town of Palmyra seized by ISIS last year, state TV has said. According to observers, the government forces have advanced into a hotel district south-west of Palmyra, a UNESCO World Heritage site. Officials launched an offensive to retake the city earlier this month, backed by Russian air strikes. Palmyra is situated in a strategically important area between Damascus and the contested eastern city of Deir al-Zour. ISIS seized the ruins of Palmyra and the adjoining modern town in May 2015. It subsequently destroyed two 2,000-year-old temples, an arch and funerary towers, provoking global outrage. The jihadist group, which has also demolished several world-renowned pre-Islamic sites in neighboring Iraq, believes that such structures are idolatrous. UNESCO has condemned the destruction as a war crime. State media showed warplanes flying overhead, helicopters firing missiles, and soldiers and armored vehicles approaching Palmyra. According to the Syrian Observatory for Human Rights, the government forces advanced into the hotel district and reached the start of a residential area but were moving slowly because of mines planted by ISIS. The Syrian troops were also making incursions from the northern part of the city, the AFP reported. There were unconfirmed reports of casualties on both sides. The Observatory said civilians began fleeing after ISIS warned them via loudspeakers to leave the city centre as fighting was drawing closer. The advance comes after the Syrian army and allied militia took control of several hills overlooking the city earlier this week. 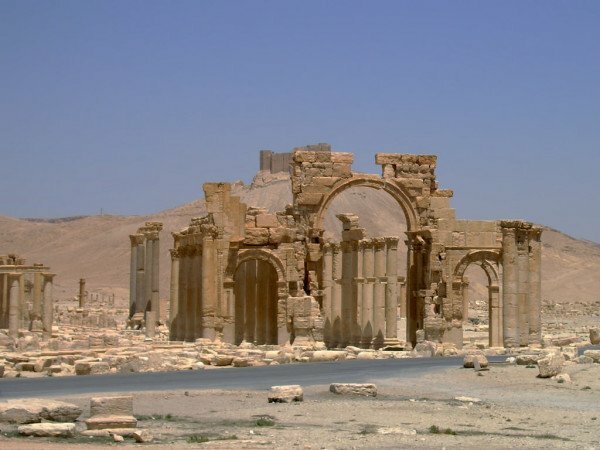 Recapturing Palmyra would be a significant victory for the government and Russia, which withdrew most of its forces last week after a six-month air campaign against opponents of President Bashar al-Assad that turned the tide of the five-year civil war in his favor. Despite the reported setbacks, ISIS claimed its fighters inflicted heavy casualties on the advancing forces, according to its weekly publication Al Naba. On March 23, ISIS issued pictures purported to show several Syrian army vehicles destroyed by its fire. However, its daily radio news bulletins have not mentioned the fighting in Palmyra in the last few days.